Sing to Life: This pregnancy! My pregnancy with Will was wonderful. Great! I felt fabulous - tons of energy - really, no symptoms worth mentioning after the initial first-trimester stretch of nausea. I loved being pregnant and told people I wasn't ready for it to be over yet. Even at 37 weeks, I was hoping for more time. I wasn't bummed at all to hit my due date. This pregnancy is so DIFFERENT! You know how it is when you start telling someone about your aches and pains and you can see their eyes kind of glaze over? And sometimes when you ask someone how they're doing and they start in on their list of health issues and you are trying to listen but you can feel YOUR eyes glazing over? To avoid that whole social exchange, I tell people, "I'm fine! I feel great!" And truthfully, I do feel fine. Fiiiiiiiiiiiiiiiine, in a grumpy tone. I think this baby is going to be a girl! She has stolen my beauty and I want it back! I have a MAJOR - MAJOR - sweet tooth. It was fine before Thanksgiving, and I was inhaling apples and oranges left and right, but now I am stuck here home alone with pies and cheesecakes and ice cream in the freezer and fridge and garage and honey butter for toast in the cupboard and sweet potato casserole and OH MY GOSH - dessert for breakfast, lunch, and dinner tastes amazing but that's pretty much all it'll do for your body. Being in my third trimester around the holidays, there are two concurrent streams of thought constantly running through my mind. One is, "I have to get my diet under control so I don't continue to blow up like a balloon in the next two months," and the other is, "What the heck, I already look like a balloon and SUGAR SUGAR SUGAR nomnomnomnomnom," which is where I turn into the Cookie Monster. So the sugar makes my skin inflame (in my defense, I really only made that connection a couple days ago) and then my face is red and itchy and burning. 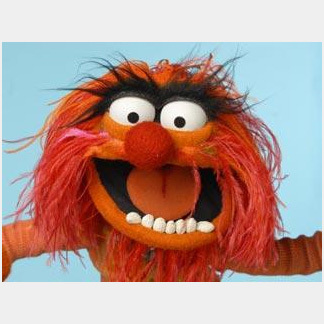 And my hormones are through the roof so I pretty much look like Animal from the Muppets. And because my little old legs can apparently tolerate only one grown woman's circulation, suddenly I'm all what the heck? are those bruises around my ankles and calves and thighs? NOPE! It's an epic explosion of veins! So I'm wearing full length circulation hose (made for pregnant women, with a convenient pouch to fit over your belly except it DOESN'T, so I'm either hiking them up all day (a really graceful gesture) or rolling it down so that the very tight band totally constricts that oh-so-conspicuous area right below the waist making an EPIC muffin top. And I've been grunting and groaning and weeping at the slightest thing and complaining about my hip pain to Brian and apparently doing some SERIOUS SNORING at night... and recently I just realized, Hey! We have a romantic getaway planned for LESS than a week from now! So I should not be trying to act like a ninety-year-old obese woman! I should probably even leave my circulation hose at home! I am laughing at myself as I write this, all the while thinking, I am SO THANKFUL to be pregnant with these issues than to not be pregnant at all. The due date for the little baby we lost in May is coming up, and while being pregnant with a different baby generates conflicting emotions, I can't imagine the grief of not being pregnant at all on this upcoming date. Last Saturday, I hit a low point while trying to squeeze myself into my circ hose for the first time. I was hanging out with Brian, trying to laugh at myself because they were NOT seeming like they were going to fit, and then I snagged them with my nail and eliminated any chance I had for returning them and suddenly I was sobbing out of control and hobbling into the bathroom with these TIGHT tights around my knees going, LEAVE ME ALONE! (which he wisely did) and then sitting on the bathroom floor going, God, why me?! I've tried to be healthy! I'm fairly young! Why do I have to wear these? Why do MY veins have to take over the world? And then the very next morning, in church on Sunday, the worship leader said something that whacked me on the side of the head. He said we all ask a question at some point in our lives, and the way we ask it reveals our hearts. That question is, Why me? And we can either ask it with pride and ingratitude (Why me? Can't you pick on someone else?) or with humility and thanksgiving (Why ME? Why did you choose ME to bless so abundantly?). And as he was illustrating his point, I realize that as I was pitifully whining, Why me?, God was also looking at all the women who are in situations far worse. And I decided I am DONE feeling sorry for myself. So while I am laughing at my aches and pains, I am truly thankful for this baby and this pregnancy. I'm also more determined to stop eating so much stinking sugar.